We have two solar wax melters, both styrofoam coolers that we're keeping out of the landfill. The small one is for white wax, which we typically only have in small amounts. 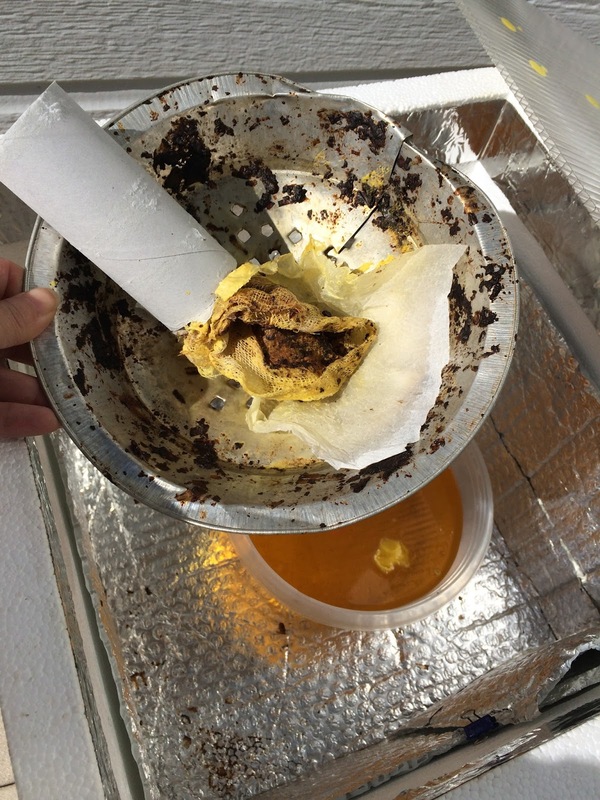 The big one gets a bit hotter and works better for old brood combs, which are notoriously difficult to get the wax out of even during one of our relentlessly sunny Colorado days. The chamber of commerce likes to brag about our 300+ sunny days, but what they don't mention is that you fry in our rarified air and the mile high altitude kills you with UV radiation. There are no shade trees to escape the sun because a) we only get 14" of rain a year (which sometimes comes all at once) here in the "subalpine desert" and b) the few that do manage to eke out a living have their tops snapped off by winter storms. But I digress. I shouldn't complain because unrelenting sun is what makes solar melters work. But wouldn't you know it? There've been clouds on the days I've been able to set the melters out and the yield's been like pulling teeth. If you don't see a sharp shadow it won't work, even if it's 98°F. Beeswax melts at about 145°F so you need the sun to power what is essentially a solar oven. Tips for Success… after the jump. Sometimes the wax forms interesting shapes and sometimes it's a flat disk. It depends on how hot the water in the catch pan is. You'll collect more of the sun's power if the melter is on a slant, with the glazing angled toward the sun. Some beekeepers use a paper towel to suspend the wax over the catch pan, but I use cheesecloth and a tin plate to conduct heat. I like to use fairly large holes, about 1/4", as this enables the wax to drip more readily. If you forego the cheesecloth, you need to perforate your tin with pretty small holes to keep slumgum from passing through. Smaller holes slows down the process, and they tend to clog if you're processing brood comb. It's important for the tin to have a low point for the wax to drain toward. As the wax drips down, capillary action encourages more to melt and fall. It's also helpful to use hot water in the catch pan so the wax doesn't harden immediately. If the wax stays liquid, debris and honey have the opportunity to precipitate out. The columnar blob on the right (above) is a tad darker because it's got honey trapped in it, which is fine if it's going to be used to make lip balm. For candle-making, this wax needs to be filtered at least one more time. The beeswax must be extremely clean and free of all impurities, otherwise the candle will sputter while burning. Bottom of the disk: cheesecloth produces a slumgum-free rendering but introduces lint to the wax. In case you missed it, I posted a hi-speed video on how this all goes together on Instagram. For even cleaner wax, use a finer mesh such as pantyhose or even silk fabric. I use cheesecloth which ends up stuffed into toilet paper tubes for new life as fire starters. Do not solar process any comb that contains beebread or crystallized honey. 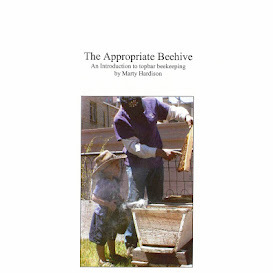 The pollen absorbs molten wax reducing yield, and the honey caramelizes. Both can be dissolved out in hot water, say in a slow-cooker but don't do it without liners unless you are willing to sacrifice the pot. I don't know why some beekeepers swear by the method, because I tested it and extracted only about a 1/4-pound of beeswax in 2 rounds of "cooking." It was beautifully golden but IMO the yield is not worth the carbon footprint. Very nice! I've been wanting to make a solar melter for awhile. This has been very inspiring and given me lots of great ideas! Thanks! @Julie Great ideas, huh? Looking forward to seeing how yours works and what you do with the beeswax. I made one similar after seeing yours and it works great! Sometimes I get a lot of little wax dots which is great for use when making things with it later on. the little wax dots are really convenient.